The Dancing Mouse and the Queen ~ Bedtime Stories for Kids No Reviews Posted. Once upon a time a wicked King from a faraway country invaded the land where a Queen ruled. The invader King captured the Queen and her baby daughter as prisoners. When he returned to his kingdom, he shut them both into the highest room of a tall tower. The room was very tiny and bare, with only one table and a very hard bed. Then the enemy King sent for a fairy who lived near his kingdom. He nearly pushed the Fairy up the stairs to the Queen's room. The Fairy was touched by the sight of the Queen’s sad condition. When she kissed the Queen's hand, the Fairy whispered to her, "Courage, madam! I think I see a way to help you." The Queen whispered her thanks. Then the evil King cried harshly, "Silence!" He turned to the Fairy. "I brought you here for one reason and one reason only. Tell me this: Will this baby girl grow up to be a worthy bride for my son?" He shut them both into the highest room of a tall tower. The Fairy answered that indeed, the Princess would grow up to have all the grace, intelligence and charm that was worthy of a throne. The old King growled to the Queen that it was lucky for them both that the Fairy had said it would be so. He would save the baby's life to become the future bride for his son. From the highest room of the tower the Fairy and Queen could hear the King's son screaming and demanding that his servants do this and that from way down below. The royal son’s mean young voice carried over all other voices and noises. The King thundered that if the Fairy had made a different forecast, both the baby and her mother would immediately have been killed. Then he stamped off, taking the Fairy with him, and leaving the poor Queen in tears. The royal son’s mean young voice carried over all other voices and noises. "How can I wish my little daughter to grow up, only to be married to the king’s horrible son!" she cried. "And yet if it weren’t so, we would both be doomed right now. If only I could hide her away somewhere, anywhere! There must be someplace safe where the cruel King could never find her." But where could the infant be hid, since they were both stuck in that tiny room at the top of the tower? As the days went on, the Queen and the little Princess grew thinner and thinner. For every day, their hard-hearted jailer gave them only three boiled peas each to eat and a tiny morsel of black bread, so they were always terribly hungry. Where could the infant be hid, since they were both stuck in that tiny room at the top of the tower? At last, one evening, as the Queen sat at her spinning-wheel - for she was made to work day and night - she saw a tiny, pretty little mouse creep out of a hole. Said the Queen to the mouse, "Alas, little creature! Why are you coming here? We have only three peas each per day. So unless you wish to starve, I'm afraid you must go somewhere else for your food." But the mouse ran here and there, and danced and twirled so prettily, that the Queen clapped and laughed with joy. At last she gave the dancing mouse her last pea, which she was keeping for her supper, saying, "Here, little one. I'm sorry I've nothing better to offer you. Your fine dancing deserves far more than this wrinkled little pea." She had hardly spoken, when upon the table appeared a delicious roast partridge and two dishes of preserved fruit. Amazed was she! Quickly the Queen mashed a portion of the meat and fruit and spoon fed her baby, who licked each spoonful with glee. Then the Queen ate with great satisfaction herself, and offered what was left to the little dancing mouse. The mouse danced even more charmingly than ever before. The next morning the jailer brought the Queen and the Princess' daily allowance of three peas each, which he brought in upon a large dish to make them look even smaller. As soon as the jailer left, the Queen gave the dancing mouse all three of her peas. The mouse danced even more charmingly than ever before. The empty dish was instantly covered with all sorts of wonderful things to eat, and the Queen shared a feast with her daughter once again. 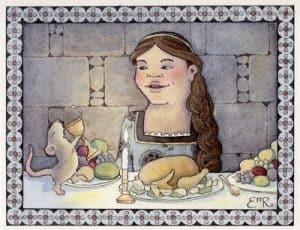 But afterwards, as she sat at her spinning-wheel, she began to worry that the fine meals could end any time, and even if they didn't, that her precious daughter was doomed to live as a prisoner, only to be forced to marry that horrid prince when she grew up. The Queen despaired, "Oh! If only I could think of some way to save her!" As she spoke, she noticed the little dancing mouse playing in a corner with some long straws. The Queen began to braid the straws, thinking, "If I had but enough straws I could make a basket with them. Then if I let my baby down in the basket from the window, perhaps a kind passerby might take care of her and raise her in freedom." By the time she had finished her thoughts, the little mouse had dragged in more and more straw, until the Queen had plenty to weave her basket. The Queen weaved the basket at night while the little mouse danced for her. At lunch and supper time the Queen gave the mouse the three peas and the bit of black bread, and always found something wonderful in their place. She really could not imagine where all these yummy dishes were coming from. The Queen weaved the basket at night while the little mouse danced for her. At last one morning, the basket was finished. The Queen looked out of the window to see how long a cord she must make to lower the basket to the bottom of the tower. Then she noticed a little old woman down below, leaning on her stick and looking up at her. Said the old woman, "I know your trouble, madam. If you like, I can help you." "Oh, dear lady!" said the Queen. "If you really wish to be of use to me, you will come later at a certain time I tell you, and I will let down my poor little baby in a basket. If you will take her and bring her up for me, when I'm free again, I will reward you splendidly." “And what is that, dear lady?” said the Queen. “You must know that I am very particular about what I eat,” said the old woman. If there is one thing that I fancy above all else, it is a plump, tender little mouse. If there happens to be any mouse in your tower, just throw it down to me, that's all I ask." Well, when the Queen heard this, she began to cry. The old woman, after waiting a few minutes, asked her what was the matter. "Why," said the Queen, "There is only one mouse in this tower, and that is such a dear, sweet little thing that I cannot bear to think of it being killed." "What!" cried the old woman in a rage. "You care more for a miserable mouse than for your own baby? Good-bye, madam! I leave you to enjoy its company. I thank my stars that I can get plenty of mice without troubling the likes of you!" “What!” cried the old woman in a rage. That night when the Queen's baby was fast asleep, she packed it into the basket and wrote on a slip of paper, "Here is my beloved but unfortunate little baby girl. Please raise her with tenderness and love." She pinned the note to the baby's robe. Very sadly she shut the basket. Just then, in sprang the little mouse. "Ah, little one!" said the Queen. "It cost me dear to save your life today." The Mouse answered, "Believe me, madam, you will never regret your kindness." The Queen was shocked when the Mouse began to speak. And even more so when she saw its little sharp nose turn to a charming face, and its paws become hands and feet. All of sudden, the mouse suddenly grew tall. The Queen recognized the Fairy who had come up to her tower room with the wicked King to visit her. The Fairy smiled at her astonished look. She said, "I wanted to see if you were capable of real friendship before I extended myself to help you. You see, we fairies are rich in everything but friends, and true friends are hard to find." The Fairy smiled at her astonished look. The Queen replied, rushing to her, "I cannot believe that you would not have many friends, you charming creature." The Queen shook her head, still amazed. “To test you,” continued the Fairy, “I took the form of the old woman whom you talked to from the window. I tempted you to forsake your little mouse friend. But this you did not do! Then I realized that you are indeed capable of true friendship." Turning to the little Princess, the Fairy kissed her rosy lips three times. The Princess cooed and giggled. "Dear little one," said the Fairy to the infant girl. "I am going to take you and your mother to my very own enchanted cottage, quite a distance from this wicked kingdom. There you both will be invisible to all others. And you, sweet baby, will grow up safe and free, and will be together with your mother." In an instant, the Fairy, the Queen, and her baby vanished from the tower prison room, never to return.